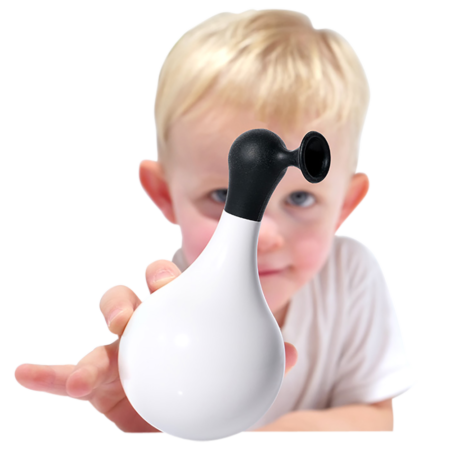 New Oogi® toys, Boi™ and Oogifant™, make for greater imaginative play! BELOIT, Wis. (July 12, 2018) — PlayMonster, the US distributor for the design-led Swiss brand MOLUK®, announces two new additions to the open-ended play line that will add play value to any MOLUK collection, and also intrigue new customers to explore the line. Boi floats and dances in and out of the bathtub. Is it a penguin, a duck or some other creature? We let the children decide. No matter how you spin or roll it, Boi always gets back upright again and continues to bravely explore the world! This tactile toy features a smooth white surface and rubbery silicone top. Find it online and on specialty shelves for $14.00 SRP. Oogifant is all you need to turn everyday objects into elephants. The tactile and highly elastic silicone trunk has suction cups on both ends that attach to any smooth surface. Hilarious moments and shared laughter are guaranteed. This expressive and tactile toy is make of silicone rubber and plays well with other Oogi® toys! Sold online and in specialty shops for an SRP of $10.00.